So it’s been almost a month since we got back from Alabama and I still haven’t posted my promised update on our mission trip. I’m sorry. Seems actual writing and me haven’t gotten along very well lately. Trying… but not very well. The short version: the trip was amazing. For those not in the know, we traveled to Alabama during April vacation to help the region recover from the massive damage across the entire state cause by a rash of tornadoes that hit the area two years ago, including a 2-mile wide F5. See www.dankeohane.com/alabama for an intro). 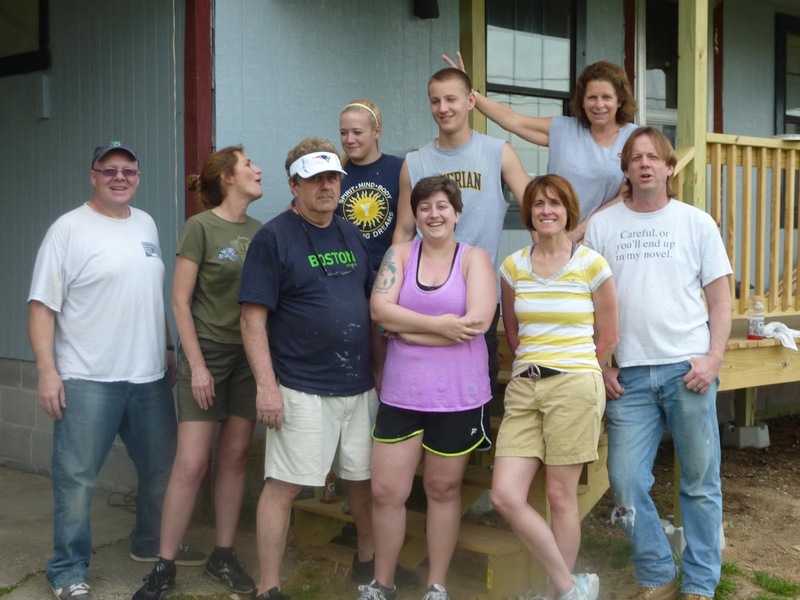 To spend a week with 30 people who began mostly as strangers and ended like family, focusing only on what we can do next to help people we never knew and would likely never see again. Just wonderful. And since it was a church trip, the closeness everyone felt with God and His #1 mission in the world – help people and show love for no other reason than to show love, was just, well, wicked cool. Sounds like I’m tooting my horn. Don’t mean to. Anyone can do it, and many other people who did not come this time were just as much a part of it - thnaks to everyone who donated so much money to send the three of us along on this trip. 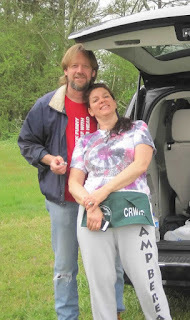 See the link above for the list of our caregivers. And so many other people do only this their whole lives. To be able to experience even a part of this kind of life is a blessing. 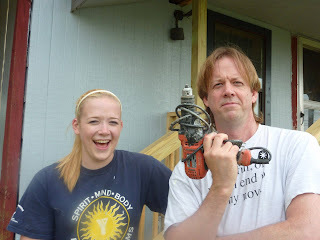 We went with talents ranging from experts in home construction to having never held a hammer before. Didn’t matter. Everyone just did whatever they needed to, regardless of experience, age, what have you. One rule going in: have no expectations. You could be assigned to do anything, from cleaning up debris to knocking down walls to building decks to laying carpet. The job was to be there, humbly love the people you serve and be ready for anything. The only planning was for stuff: blankets, pillows, clothes, tools. But what would happen would happen. If you expect nothing, then everything is gravy. I spent the entire week working at one site, along with a dozen or so other folks, working on an older couple’s house – painting, tearing out old boards and shoring up the walls outside. Inside, I and a few others (by the end of the week we were down to two, me and spunky young Cameron who had so much enthusiasm (and thankfully construction experience) that it was contagious). Our job was to replace a damaged living room ceiling. 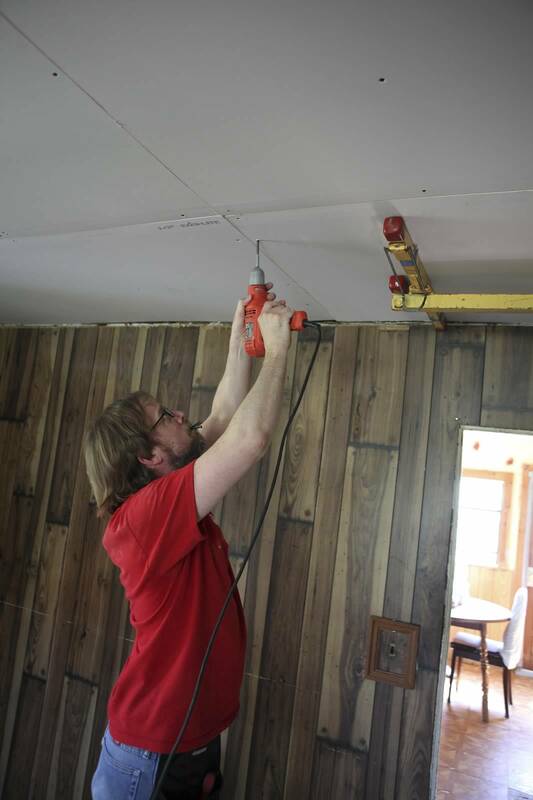 We tore down the old ceiling and laid plaster board over the exposed beams (we had a cool lifter tool for this so no backaches), taping, seaming and painting. We JUST finished the work on the last half day before leaving on our 3 hour drive back to Atlanta and the airport. Funny thing is, God provides. The first day we got there, I discovered the family had 15 cats – yep, fifteen – and those who know me know how allergic I am to cats of any breed. But a girl in our group, Erin, had a box of these Alka Selter allergy gel caps, and I took those each morning. Not one sniffle, no sleepiness, nothing. It was as if my allergy was gone! I thought it was, until the last day when we came back to clean up and finish the work inside, and there were no more pills! No problem, I thought. I started working inside and within 10 minutes was stumbling outside, unable to breathe. People thought I was sick – but the allergies were so bad I had to work outside the rest of the morning. Still, we had finished the living room and the couple were extremely nice and very grateful. Amanda started work on one of the other major sites: tearing down a barn which had been damaged in the storms but still staning. Over the course of the week the group tore down one wall, then another (at one point the ceiling collapsed on top of Dena, our fearless leader, who narrowly avoided getting seriously hurt). Amanda next day joined my group at the house and spent a week in the sun painting the outside trim and shutters relentlessly (I got a lot of comments on my daughter’s dedication to her job). Funny: there were bees everywhere (big ones) flying out of the eves all week. On Day One people were running away, swatting at the air in general bee-panic. 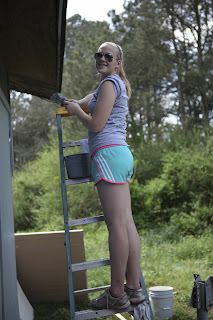 By mid-week, you’d watch fascinated while Amanda and everyone else stood on ladders and painted, surrounded by bees flying around them non-stop, and not even flinching. A lot of phobias were conquered at our site. Linda replaced Amanda at the barn site, helping to pull down the last of the walls and then lugging ALL of the scrap wood (it was a BIG barn) across the property for burning. She also went to another site where work was finished a previous week and spent a day using these magnet thingies picking up stray nails (not just from construction, the area was still littered with nails from destroyed homes). On her first day, she spent the entire time on top of a trailer home in the sun painting sealant along the roof. 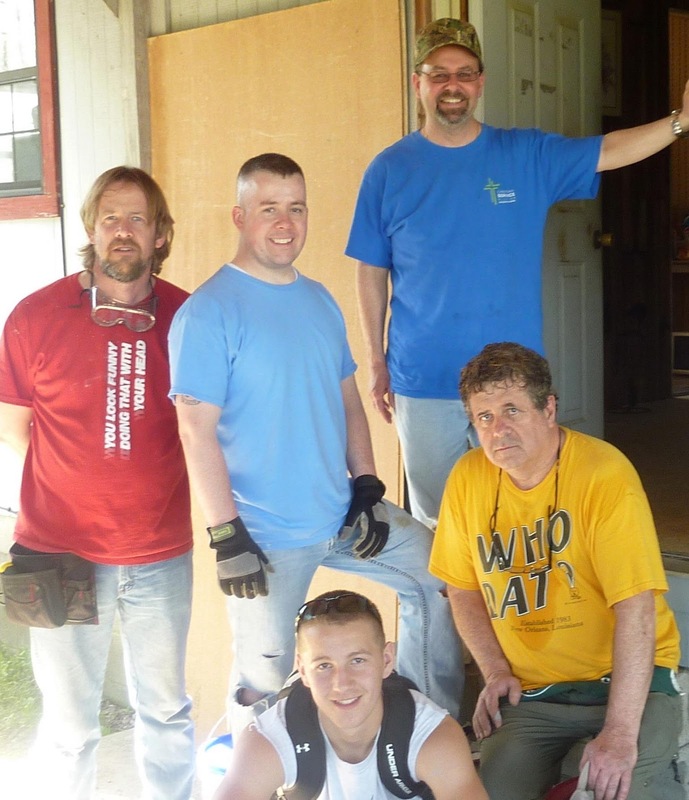 We also had a group later in the week building a new porch for a family, and doing repairs on their roof. It was joyous, fun, rewarding work, from the moment we started to the moment we drove off in our 5 rented vans for Atlanta. We worked in and around the town of Rainsville, Alabama, and stayed at this massive Baptist church in town. The congregation gave us the run of the entire place for the week. We expected a small, crowded place but found that we could have fit 200 people comfortably if we needed to. Every morning someone would give a devotional (a sort of mini church service where we play a song or two, read from scripture and give a little talk about how the scripture or song applied to what we were doing, etc, lasted about 20 minutes or so), then broke into small groups and talked about the day to come. A woman, Dawn, was in charge of food, and spent all morning from around 4:30 AM making breakfast and packing pre-made lunches for everyone along with her team of volunteers. Every day at the site I had a brown paper bag lunch with peanut butter and jelly (my choice!!) and a small salad, snacks, and lots of water. One night we all went out to dinner at a rib/meat place. One night we went bowling – a mad jumble of chaos and … well, mostly chaos, but it was fun. We had a scavenger hunt inside the church, talked about the one room in the church FILLED with puppets (about a hundred of them). It was creepy and cool (there’s a very big youth program in this church we were staying at). Highlights for me? Well, there was the laughing, and joking, all day long. My group every day had people like Artie and Chris and actually everyone just had an amazing sense of humor. At one point I was taping the ceiling and the gentleman who lived there came out with a smile and said, “You have a really happy group.” Because everyone outside was laughing hysterically over something. It was so constant I had stopped hearing it. And they were filthy with paint and dust and scraped all over from cutting and tearing boards. Having a great time. I did the devotional Thursday morning after breakfast. Talked about how we’d be going home Saturday to our previous lives, and the latest developments on the Boston Marathon bombing, and to try and bring what we have gained from the trip, the sense of Sprit, the closeness to each other and God, and of course a new perspective on the world. Something like that. I don’t think I sucked too badly. But it was cool to be able to stand there and, well, not really “preach” but it was kind of. And to do so with my daughter there. My wife Linda also did an amazing job on Tuesday when she did the devotional, and it was very cool watching and listening to her. She’s so there and real. That was a major highlight – every morning listening to one of our friends stand up and talk about their faith, about their relationship with Jesus and how it helps them or challenges them. Not something many people do to start the morning. I miss it. The biggest thing I hope everyone who went or heard about our trip later might take away from all this. Many people who do not consider themselves a Christian, or even religious, have given their time and talents over and over, when people are in need. But as a Christian, moments like this are a stark reminder that this is what it's about. Having a personal relationship with Jesus Christ and letting the love and forgiveness He offers everyone to spill out to every person we meet. It's about loving the people around you. Unlike the... misguided individuals who think it means judging others, filing humanity into the Right and Wrong of the world. Our role while we're here is just the opposite. We are no better than anyone else, be they a poor couple in a small Alabama town, a middle class family who got screwed by their insurance company, someone who just needs a ride to Walmart (there's a long story behind that), a priest or a homeless person, black or white, straight or gay, man or woman, God loves them 100% just as much as every other person on this planet, past, present or future. All you have to do is accept it, and some pretty amazing things happen in your life. For those of us who, often reluctantly, acknowledge that love as real, our only job is to be open with our lives and share the abundance we've gotten with others. No strings. No rules. Show God as He is, really is, and show his love in the only way we can. With a "Good Morning," a comforting word or hug, a smile, or a nail and hammer if required. He does the rest. So, there’s probably more, but I’ve gone on long enough I think. Like I said, it was an amazing time, and we’re all looking forward to the next one.